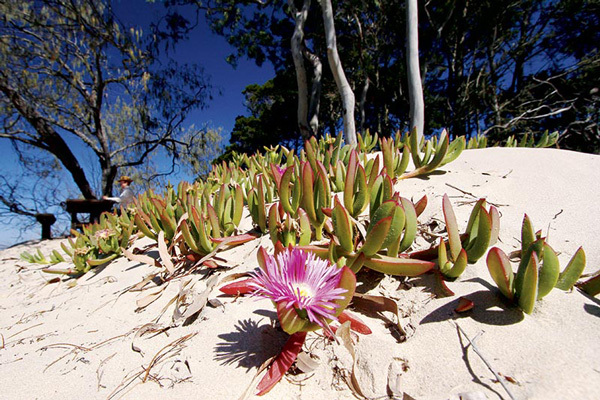 With the many natural attractions Fraser Island has to offer, it’s not surprising that its lesser known (but no less beautiful) neighbour the Burrum Coast National Park (NP) is often overlooked by travellers in the region. 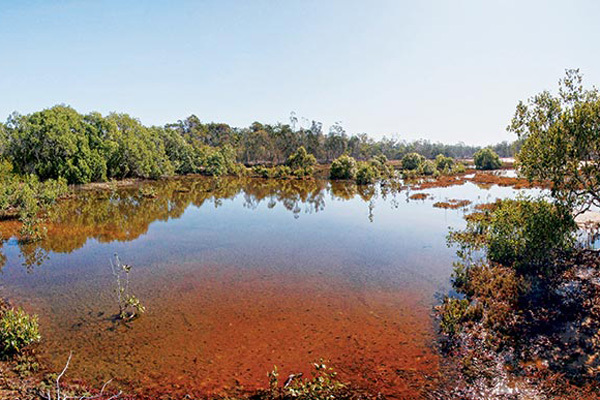 But a day spent enjoying its lowlands, waterways and beaches revealed a 26,000ha wallum wonderland that offers an unforgettable eco-adventure in the largest and most pristine coastal plains of south-east Queensland. On a cloudless, mid-winter day, with 24°C the projected maximum, we packed our hiking boots, swimming gear and a picnic lunch, and hit the road from Hervey Bay through Childers and the rolling terra rossa canefields to Hoppy Larks day-use area at the southern edge of the park (Woodgate section). The firm gravel track of Heidkes Road makes for an easy dry weather drive through open woodland to this rest area on the banks of the Gregory River, a tributary of the Burrum. 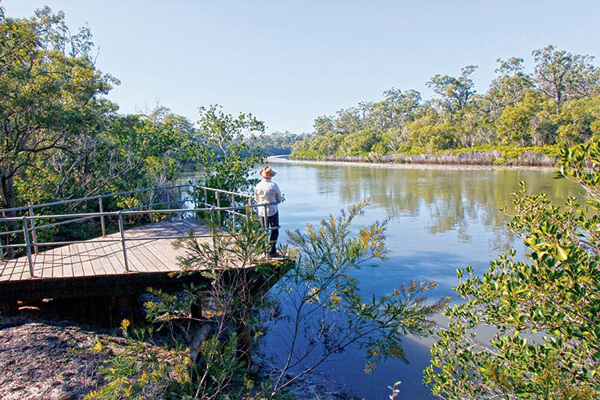 From the carpark, a wheelchair accessible track leads to a viewing platform and picnic table overlooking the Gregory. On our arrival, flowering wattles surrounded the deck and the short trail down to a fishing platform at the water’s edge with expansive views of the lush riverine landscape. 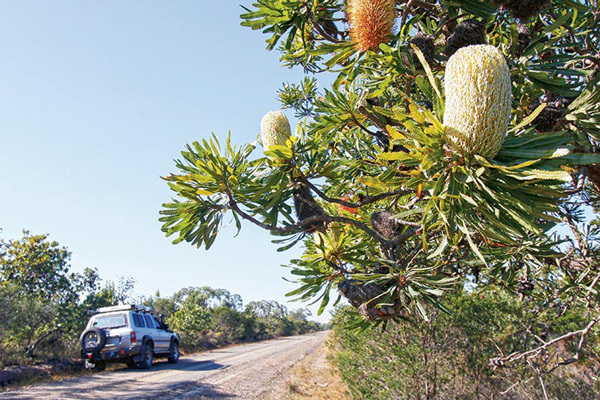 Heidkes Road continues through the park adjacent to the river and traverses a sandy lowland dominated by large robust banksias (called ‘wallum’ in the local Aboriginal tongue) with gnarled trunks, huge pale yellow flowers and tough, serrated leaves. By day, wallabies, bandicoots and goannas roam this habitat and, at night, feathertail gliders, rare grass owls, and tiny carnivorous marsupials forage for food. In spring, this heathland comes alive in a spectacular display of delicate wildflowers. Part way across this low-lying plain, the road becomes an elevated causeway through a shallow, tannin-stained mangrove swamp rimmed with salt-hardy samphire. Saturation-prone sections of the track have been overlaid with coarse road rubble to provide an all-weather surface but might still prove impassable in seriously wet conditions. A little further on, the road reverts to firm-packed sand as it enters a eucalypt woodland and skirts the Burrum River on its way to the tiny hamlet of Walkers Point. Here is another well-appointed day-use area replete with picnic tables, a concrete boat ramp and a sealed 250m wheelchair-friendly walking trail. At intervals, pull-outs have been constructed at ‘Protected Shell Midden’ sites that make good spots for fishing, with filleting tables and easy access to the water. These middens form part of a much larger cultural and archaeological landscape evidencing intense Aboriginal occupation of the Wide Bay region for about 25,000 years. 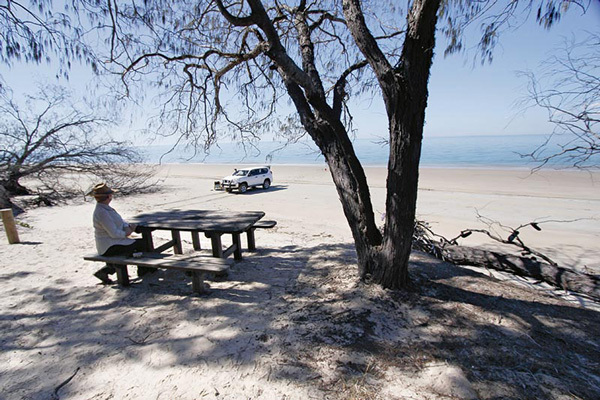 From Walkers Point, travellers can take a good sealed road to the delightful township of Woodgate Beach or the soft sand track to the camping area at Burrum Point. The latter is a 4WD route only and not suitable for low clearance caravans or trailers. Access may be further restricted by local flooding during wet weather. Tucked among coastal woodland behind fragile dunes, the camping area offers sandy sites suitable for tents and offroad camper trailers, and facilities that include water, cold showers and toilets. 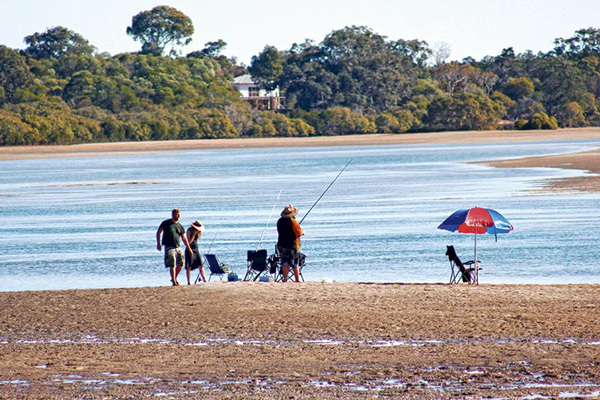 The river and open beach are accessed by a short walking track from the camping area and an entry point for vehicles. Several walking trails emanate from the camp, including Russell’s Rest track (500m return) to a picnic area overlooking the beach, the Birdhide Walk (4.5km return) to the edge of a shallow wetland with abundant birdlife, and the (12.3km return) Melaleuca Circuit through wallum plains, salt pans and mangrove swamps. The easiest way to get from Burrum Point to Woodgate is to drive north along the beautiful, hard-packed beach to an exit point at the southern edge of the township. 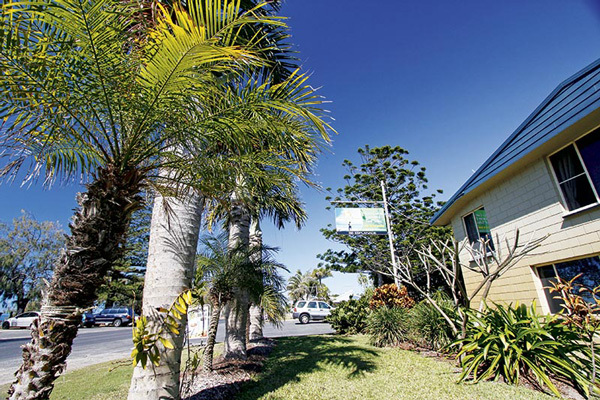 There is a range of holiday accommodation here including rental homes and units, and the Woodgate Beach Tourist Park which has villas, cabins and shady sites for rigs of all sizes. At the northern end of the town is a very nice day-use area, with vehicular access to Theodolite Creek and the Kinkuna Fish Habitat. A short distance west of the town along Woodgate Road is the junction with a 4WD track that provides access to the Kinkuna section of the national park. 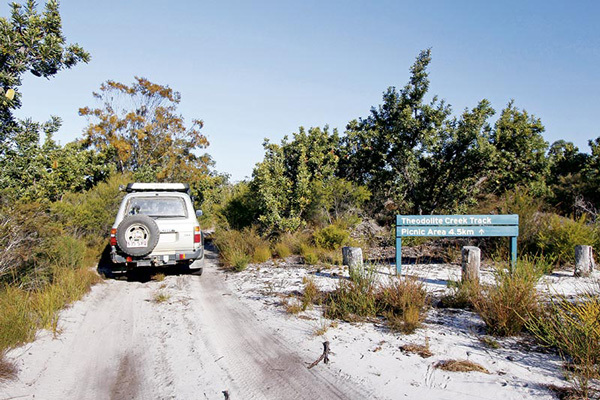 From this point, a soft sand track makes an interesting 14km drive across a banksia heathland to the Kinkuna Camping Zone at the northern end of the park. About 10km along this route is the junction with the Theodolite Creek Track, which leads to a day-use area with a picnic table (but no other facilities) on the northern bank of the mangrove-lined creek. 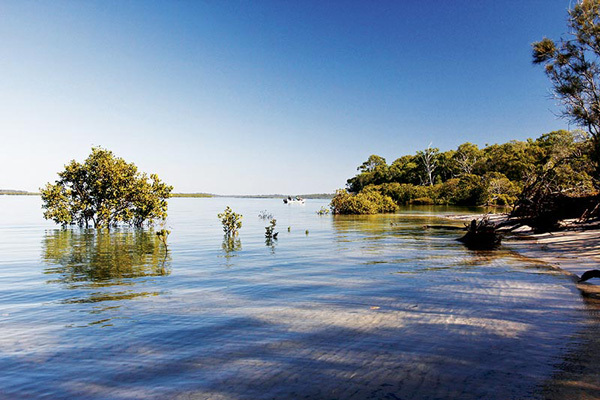 If you’re into eco-adventuring by the sea, and don’t want to pay the ferry fares to Fraser Island, the Burrum Coast National Park is the place for you. It offers something for everyone, all year round, in the blissful seclusion of south-east Queensland’s most pristine coastal plains, and all within an easy drive from Bundaberg or Hervey Bay. 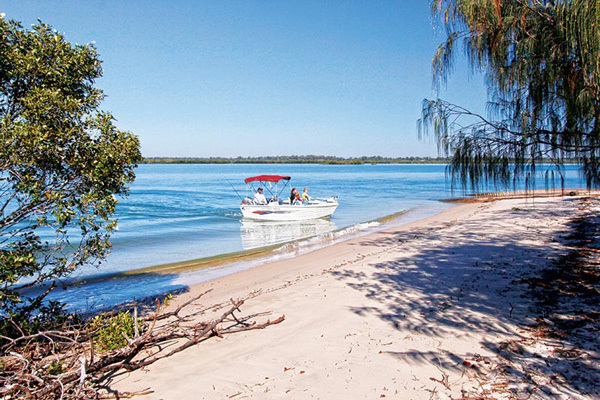 Burrum Coast National Park is spread over four sections ranging between 25km and 95km south-east of Bundaberg, or within a one-hour drive from Hervey Bay. 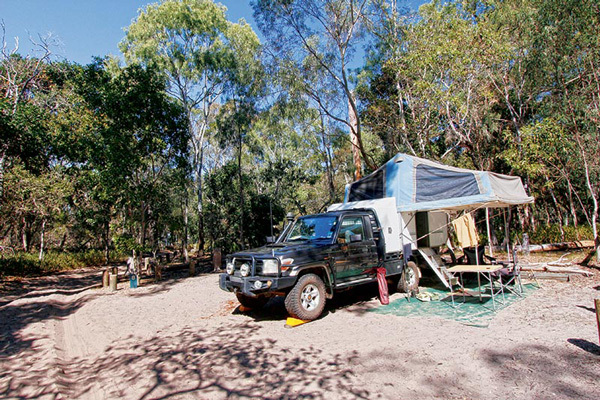 Camper trailer camping is available at Burrum Point Camping Area, accessible only by 4WD. 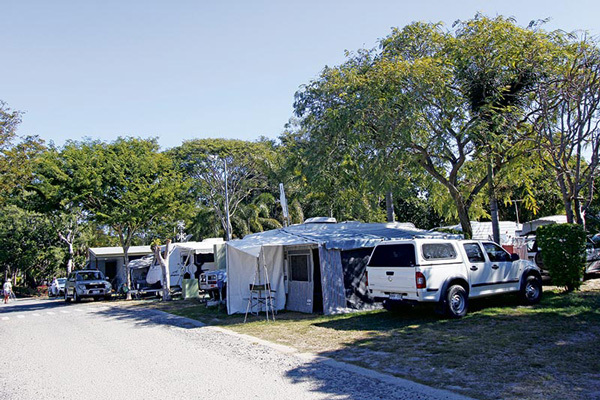 Camping permits must be obtained online before arrival at the camping areas and fees apply. Book well in advance for school holidays and long weekends. Fuel and supplies are available at Woodgate Beach and Burrum Heads.